When Is Worship Not Worship? 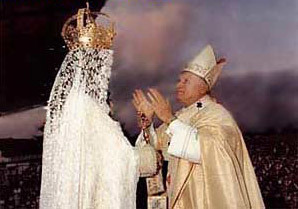 Those who would defend Roman Catholicism persistently press the illogical and invalid assertion that the Roman cult neither teaches nor in fact practices worship of Mary. They argue that, as concerns Mary and the other ghosts in the RCC pantheon, worship does not mean worship and venerate does not mean worship and render homage does not mean worship and pray to does not mean worship and sacrifice to does not mean worship. Words can be used to convey many meanings, a fact the Magisterium has consistently used to its own purpose. Regardless of what those who speak in Rome's cause may claim or of how they redefine word meanings, the Roman Catholic hierarchy indeed do foster mariolatry, worship of things and the spirits of the dead. When the Ladies' Sodality meets every night in the chapel to toll their beads and pray the Rosary, they are rendering worship to Mary. When a little old man struggles up to a statue of Mary and, falling to his knees before it, places coins in a box, lights a candle and offers prayers to her, that is worship. When a Blackrobed Benedictine oblate prays to St. Maurus and calls upon him to heal a dying child, he is not only praying to a spirit for a miracle but actually is rendering a low-level of worship. When the Catholic faithful genuflect or cross themselves when passing in front of the tabernacle where a consecrated host is kept, they might claim they are rendering honors to Christ, but the fact is they are paying homage to a cracker. In this Catholic dictionary, the words devotion and reverence are used to help define veneration while worship and adoration are used to distinguish between the service rendered to saints and that given to God. Should one press the issue and seek to learn how this Catholic source defines the terms used, the issue becomes more clouded. So, adoration is an outward act of worship that may be internal. It is giving worship to a person or thing but should be rendered to God alone. Yeah, that's clear. Some Catholic apologists might be quick to point to the differences between dulia and latria as evidence that Catholics do not worship Mary or any of the saints in the Roman Pantheon. However, this is playing with word meanings – semantics, if you will. "WORSHIP. The unique adoration and reverence paid to God, called latria; the word is sometimes used for the honour paid to the saints (dulia), but this is better distinguished by some word such as "veneration." (Donald Attwater, Ed., A Catholic Dictionary, The MacMillan Company:New York (1942); w/Nihil Obstat and Imprimitur). "The word worship (Saxon weorthscipe, "honour"; from worth, meaning "value", "dignity", "price", and the termination, ship; Lat. cultus) in its most general sense is homage paid to a person or a thing. In this sense we may speak of hero-worship, worship of the emperor, of demons, of the angels, even of relics, and especially of the Cross. This article will deal with Christian worship according to the following definition: homage paid to God, to Jesus Christ, to His saints, to the beings or even to the objects which have a special relation to God.
? if it is addressed directly to God, it is superior, absolute, supreme worship, or worship of adoration, or, according to the consecrated theological term, a worship of latria. This sovereign worship is due to God alone; addressed to a creature it would become idolatry.
? When worship is addressed only indirectly to God, that is, when its object is the veneration of martyrs, of angels, or of saints, it is a subordinate worship dependent on the first, and relative, in so far as it honours the creatures of God for their peculiar relations with Him; it is designated by theologians as the worship of dulia, a term denoting servitude, and implying, when used to signify our worship of distinguished servants of God, that their service to Him is their title to our veneration (cf. Chollet, loc. cit., col. 2407, and Bouquillon, Tractatus de virtute religionis, I, Bruges, 1880, 22 sq.). Notice that in this official source, we are taught that devotion to Mary is a vital part of Catholic worship. In the citation from the Catholic Encyclopedia, devotion was used to define the special worship rendered to God alone. Sonuvagun! Here, the Catechism talks of the veneration rendered images and such. The Catholic Encyclopedia used the same word to describe the worship tendered saints. The thinking Catholic might acknowledge that, in the face of the foregoing evidence, Catholics indeed do worship Mary, saints and things. However, he likely then will seek to dismiss this clear infraction of the First Commandment by pointing out that the Catholic sources that use the word worship in reference to things and saints and such clearly define that it is not the adoration they give only to God. Let me draw a parallel from the real world to demonstrate the flaws in the above argument. Notice my use of the word in these statements: 1) I love my wife; 2) I love cheesecake; 3) I love sleeping late. Each of these is a true statement; however, each expresses a different degree of love. All are accurate uses of the word, which has many applications. One wonders why Roman Catholics have such a difficult time admitting that the word worship similarly has multiple levels of application. Rome has an arsenal of definitions for worship and draws from it according to the needs of the moment. The Catholic apologist is quick to point out that, should the RCC declare that the worship or veneration given to the saints is not the adoration that belongs to God, it shows that a clear line has been drawn as to what the church wants. At this point it is worth noting that most Christians who post to this board have demonstrated a consistent literal/historical/grammatical hermeneutic, whether looking at a passage in the Word of God or a logia from the Catechism of the Catholic Church. I do not recall any Christian post here that adamantly argued that Catholic teaching required worship be offered to Mary and other spirits and things in the same manner or at the same level as that rendered to God. Like the cult of Mithra, from which so much of RCC doctrine and practice is derived, Catholicism is explicit in declaring three levels of worship for her gods and sacred objects. Rome has declared, in her Catechism, in her Code of Canon Law, in her councils and papal pronouncements, in her breviaries, liturgies and church calendars, that worship is tendered, at different levels, to God Almighty, Mary and all the pantheon of saints and to their leavings. Acts 10:25-26, "And as Peter was coming in, Cornelius met him, and fell down at his feet, and worshipped [proskunei] him. But Peter took him up, saying, Stand up; I myself also am a man." Golly gee! A council of the Catholic Church used the word to describe the worship due objects that the Holy Spirit used to describe the inappropriate worship Cornelius attempted to give Peter. Guess there are times when the RCC indeed does teach that things are to be worshipped. This passage is made more interesting when one considers the RCC fantasy of apostolic succession. In Acts 10, Peter refused to permit people to bow down to him or to worship him in any way, yet those who claim to be his successors offer their hands or rings or feet to be kissed and seem to enjoy being carried about on the shoulders of men, just like those idols the churches parade through the streets every now and then. Has the Roman Catholic Church in fact, if not in their written word, elevated Mary to the level of deity? I believeit has. Isaiah 45:19 I have not spoken in secret, in a dark place of the earth: I said not unto the seed of Jacob, Seek ye me in vain: I the LORD speak righteousness, I declare things that are right. Isaiah 45:20 Assemble yourselves and come; draw near together, ye that are escaped of the nations: they have no knowledge that set up the wood of their graven image, and pray unto a god that cannot save. Isaiah 45:21 Tell ye, and bring them near; yea, let them take counsel together: who hath declared this from ancient time? who hath told it from that time? have not I the LORD? and there is no God else beside me; a just God and a Saviour; there is none beside me.